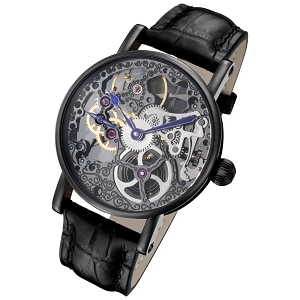 The Tattoo Black Mechanical Skeleton Watch by Rougois is a watch for the timepiece enthusiast who wants to steer away from modern minimalism and instead enjoy the visual intricacies of a watch. The movement is visible from the front and back thanks to the scratch-resistant mineral crystals that protect the silver and gold dial from the elements. The complex dial is housed inside of a 44-millimeter diameter case that features handsome IP plating over stainless steel for durability and style. This watch features a reliable water resistance depth of up to 30 meters, and inside, there is a mechanical wind-up movement that keeps the time in an old-fashioned way. The strap of this timepiece is made from handsome black leather with a complementary buckle clasp.